Learn everything you need to know about your 35 week old baby. Track important developments and milestones such as talking, walking, growth, memory & more. 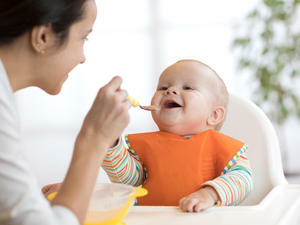 By this week your baby's pincer grasp has likely improved to the point that she's able to easily pluck small pieces of dry cereal or fruit off her high-chair tray. She might also be able to rake an object toward her with her fingers, then grab it with her palm. You might even notice that she's learned how to bring a toy closer to herself by pulling on the blanket that it's sitting on -- a sophisticated skill that indicates the ability to use tools to accomplish her goals. Around this time, your baby will also start collecting and sorting things. She's learning the basics of quantity, with games in which she places one object after another in a cup or sorting blocks into piles. Even if she used to love entertaining herself in her high chair or play yard, don't be surprised if she begins to absolutely loathe it now. She's so mobile that she just wants to move -- all day, every day. Let her explore as much as possible, but don't feel bad if you need to confine her for a short period of time while you cook dinner or pick up the living room. Just make sure she has plenty of toys to entertain herself. Household objects fascinate 8-month-olds, so hand over some pots and pans. Or fill an empty plastic soda bottle with colored water; duct-tape on the lid and you'll have an eminently shakeable new plaything. Along with all this great hand-eye coordination comes a fascination with picking up -- and mouthing -- any small object she can find. Your baby actually prefers teeny things to big ones right now. Eventually, she'll probably wind up with a mouthful of something she shouldn't -- such as a bite of dust bunny, a pulverized cracker crumb from the carpet, or a piece of dirt she gingerly plucked from the houseplant. If she discovers desiccated food on the floor and gulps it down before you can stop her, well, welcome to motherhood. And don't panic. Most experts will tell you that while it's disgusting, eating old food or bits of household dirt is generally harmless because the germs found on the ground aren't typically the kind that can make her sick. Still, a semiclean house might give you more peace of mind and reduce the chance of your baby finding a forgotten choking hazard, such as a lost Lego. So sweep or vacuum every few days, wipe the kitchen counters with a nontoxic spray (a homemade mix of baking soda and water is a great inexpensive cleaner), then let it go, reminding yourself that there are more important things than cleanliness -- such as relaxing with your baby. 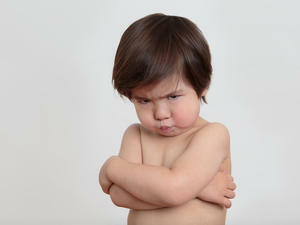 Babies are adorable, sweet, affectionate, charming -- but they're not exactly etiquette experts. And every so often, your baby's behavior might leave you scrambling to hide your red cheeks. Case in point: If your baby has stranger anxiety, she might shriek in fear at the sight of family members she doesn't see all the time -- such as Grandma from Florida or Auntie Megan who goes to college 2,000 miles away. That can lead to humiliation and hurt feelings on their end -- and a lot of helpless anxiety and embarrassment on yours. Naturally, your baby isn't trying to hurt anyone's feelings, and she definitely didn't aim to mortify you. She's just being a baby, behaving in instinctual ways that might not make her the belle of the ball. Our advice: Play it cool. It's OK to calmly apologize for her behavior ("Sorry, I guess Jane doesn't want to be held right now") and explain that your baby takes a while to warm up to people she doesn't see every single day. Adding a note about the developmental normalcy of separation anxiety can't hurt either. The more relaxed you are about the episode, the sooner your baby will warm up to her relatives, and the sooner your mother-in-law will laugh it off. One thing you learn from having a baby is to expect the unexpected. Meeting even the most bizarre behavior with good grace marks you as an expert mom. Encourage your baby's social and emotional development by making eye contact with her. How can I help my baby stand up?